The Takamine GF15CE is an ideal guitar for beginners fingerstyle players or anybody looking for a compact guitar with a warm and balanced tone. The Takamine GF15CE features solid top construction Takamines compact FXC body shape with a Venetian-style cutaway and superior sounding electronics. 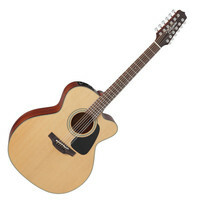 The Takamine P6JC 12 string is powerful loud and resonant thanks to its combination of solid Spruce and Flamed Maple. The P6JC also features top of the line on-board electronics and a smooth Venetian cutaway that allows for greater playability. The Takamine P3NY Pro Series electro-acoustic guitar delivers a full bodied and crystal clear tone thanks to its smaller New Yorker Parlor style body. The P3NY features top of the line on-board electronics and a smaller body that allows for smoother playability. The GF30CE is a sleek electro acoustic guitar ideal for beginners fingerstyle players or anyone looking for a sleek and compact guitar with a warm and balanced tone. The GD10CE-NS is an outstanding electro-acoustic for those looking for a reliable sweet sounding workhorse without breaking the bank. Thanks to the Takamine TP-E pre-amp with built in tuner this guitar is ready for the studio or stage. Select Spruce combines with a satin Mahogany back and sides to yield rich and dynamic tones. The 12″ radius fingerboard lends itself to effortless playing for all genres of music. The GJ72CE is a commanding electro acoustic made for the stage. Jumbo body solid top construction stunning cosmetics and premium electronics make this guitar something special. The Takamine Taka-Mini GX18CE is a 3/4 size guitar that features custom designed bracing and a scaled down version of the famous Takamine NEX body style. The NEX body combined with a solid Spruce top and Mahogany back and sides delivers an all-round tonality with plenty of volume and an incredible balance to the tone that is perfect for supporting vocals. The Takamine GD11M Acoustic Guitar features the classic dreadnought body providing a powerful low end with crisp highs and plenty of volume. The GD11M has a Mahogany top with Mahogany back and sides as well as a Rosewood fingerboard and a stunning natural finish – This acoustic guitar looks as great as it sounds. 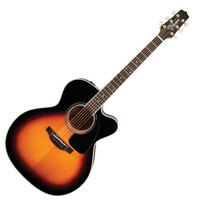 The Takamine P1JC 12 String Electro Acoustic Guitar sits at the entry point to Takamines Pro Series of guitars and represents a professional guitar without an eye-watering price tag. The P1JC Electro Acoustic provides warmth and mature richness thanks to its solid cedar top whilst sapele back and sides add fullness and balance to the overall sound of this exceptional workhorse. The Takamine P6JC is powerful loud and resonant thanks to its combination of solid Spruce and Flamed Maple. The P6JC also features top of the line on-board electronics and a smooth Venetian cutaway that allows for greater playability. The Takamine LTD 2015 RENGE-SO is a stunning electro acoustic guitar which features high quality tone woods such as a Spruce top and Rosewood body to deliver crisp and articulate tones. Also featuring a Mahogany neck with Ebony fingerboard the LTD 2015 is a joy to play acoustically but really comes to life when connected to an amplifier with the tube driven CTP-3 preamp. The RENGE-SO also incorporates unique abalone inlays and a pickguard with graphic to compliment the gloss black finish. 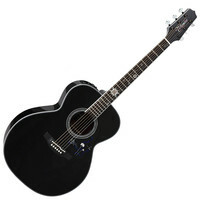 Includes Takamine GC500 hardcase. 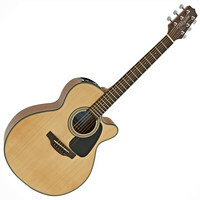 The Takamine P5NC combines the power of a dreadnought style body with a great balanced tone all from Takamines NEX body as a result this guitar is perfect for singers due to the way it complements the vocal range. The P5NC also features top of the line on-board electronics and a smooth Venetian cutaway that allows for greater playability. The GN20-NS features Takamines unique NEX body shape – physically compact but sounding as full and well projected as bigger acoustic guitars. The GN20NS delivers the warm and full tones of a solid Cedar top combined with the balanced response of satin Mahogany back and sides. The result is a rewarding and sweet sound for all playing styles. The 12″ radius fingerboard lends itself to effortless and accurate playing for all genres of music. The Takamine P5DC Dreadnought Cutaway electro-acoustic guitar brings traditional sounds into a contemporary body for the best of both worlds. The P5DC also features top of the line on-board electronics and a smooth venetian cutaway that allows for greater playability. The Takamine GN10 is an ideal guitar for beginners fingerstyle players or anybody looking for an affordable huge sounding acoustic guitar. The GN10 features Takamines revolutionary NEX body shape that allows the guitar to produce full rich and organic acoustic tones without sacrificing any comfort.